The Entertainments agency for all things marvelous! This great new site showcases everything one could need for your event or party. This site is modern, clean and easy to navigate through the exciting acts ranging from stiltwalkers, fire-eaters, magicians, DJs, themed decor and much much more . .
Modern mobile friendly re-design for leading Sussex Door to Door distribution company. Design also has wordpress integration for updating with ease. Exciting ‘What’s on’ and ticket outlet for events and things to do in Brighton. Mobile friendly, clean and has great admin functionality. When Dieter approached Cloud 8, he gave us a brief for an eye-catching and minimal style for his performance coaching site. With many of his business clients being on the move, a mobile friendly version was delivered too. Murrays were looking for a clean and professional website that represents the professionalism of their legal company. Based in London and specialising in criminal defence work, Murrays are a friendly company that have an excellent reputation. Edge hair and Beauty wanted a brand new site to coincide with the launch of their new salon in Croxley Green, Nr Watford. We worked together to create a stylish and fully bespoke website, logo design and an integrated booking service. Kirsten Chick’s new natural nutrition website is bright, informative and and easy to navigate. Packed with information, resources and educational videos this new website is also optomised for mobile too. With the front page automatically displaying the next sessions available, this boxing gym website was designed to meet all the functionality a sports gym could need, timetables, trainer sections and facilities all clear and ease of use. Frankie Vaughans Sandwich deliveries. A great shop providing a fresh lunch delivery in the centre of Brighton. Fresh and clean site with fully customised sandwich ordering system with admin access. Subscription based advert/music industry site for professionals involved in the creation of today’s top TV commercials. Full design with backend database integration. Full screen responsive business portfolio for professional Flooring Contractors in Sussex. A lovely full screen background website, mobile friendly with logo design too. Preventia Services provide leading-edge cyber security services, both managed and professional. The site incorporates a news blog, social network integration with a mobile ready version. Professional photographer Jude gave us a creative brief for a sophisticated and clean design that enhances his superb work. The site is centered both vertically and horizontally so it sits in the centre of the page and also has a blog section built in. Our brief for a leading online boat sales website was to create a striking and memorable logo design, easy to use and fully searchable database. The site is built to allow public and trade customers to advertise their boats for sale, add images and edit details. Website for family run business – Barleycorn removals offer quality house moving services in the Reading and Oxford and Berkshire areas. A clear website that shows the full range of services they offer from removal to strage and packaging. The successful sports photography company that provides great photos on the day at sporting events were looking to expand online. Capture the Event, now have a superb photographic ecommerce website with photo products now available to buy online. Bespoke vintage fascinators, hats and headpieces are now available online after Lilly Lewis asked us to develop her online shop and blog. The site is customised to enhance these fabulous speciality pieces. 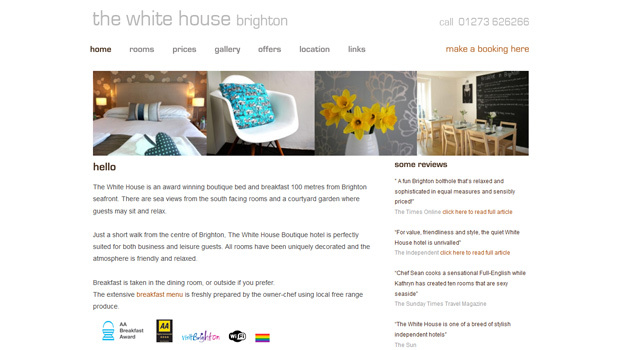 Located in Brighton’s Kemp Town area, the award winning Boutique Hotel, The White House were looking for a redesign to show off their uniquely decorated rooms and to enhance their presence online. This new site now also includes a great portfolio video, is fully updatable and looks superb on a mobile too. Cloud 8 were asked to create a modern and usable site for Arc. The site was developed with a full admin area enabling the staff to update vacancies as and when they came in. Arc also has the facility now to publish their own news blog articles . We created an eye-catching site for Platinum Pole parties to show their extensive range of Hen party experiences and Pole dancing parties that has seen the business grow and develop to it’s current popularity. Local Rottingdean Garage asked us to create a modern and friendly website to promote their comprehensive list of services and MOT facilities. We certainly delivered and they were very pleased with the quality, design and are now enjoying their new web presence. Give us a call or fill out the form to let us know about your plans. Whatever your project we would love to hear it!